Paul Bro has performed throughout the United States and Canada as well as in Austria, France, Germany, Italy, Japan, and Taiwan; he has also served as an artistin-residence at the Banff Centre in Alberta, Canada. As a soloist, Bro has appeared on several New Music Chicago concerts, on Columbia College's Contemporary American Music Program, at the Midwest International Band and Orchestra Clinic, and at the Indiana Music Educators Association Convention. As part of the Bro/Street Duo, he has appeared on Minnesota Public Radio and the Canadian Broadcasting Corporation. Bro has performed with the Chicago Symphony Orchestra, the Milwaukee Symphony Orchestra, the Chicago Sinfonietta, the Grant Park Orchestra of Chicago, and the Lydian String Quartet. 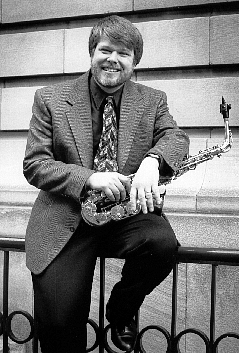 He is the alto saxophonist of the Chicago Saxophone Quartet, which released its first compact disc on the Centaur label (1991), and its second compact disc, "Capriccio", on the Truemedia Records label (1994). Dr. Bro is an associate professor of music (saxophone) at Indiana State University in Terre Haute, Indiana. He received his Doctor of Music and Master of Music degrees from Northwestern University, where he studied with Dr. Frederick Hemke. Dr. Bro is First Vice-President of the North American Saxophone Alliance (NASA). Jimmy Finnie, percussionist, joined the Indiana State University music faculty in 1994. Before moving to Indiana, he taught at East Texas State University and performed with the Northeast Texas Symphony and the Pandhadlers Steel Drum Band. He is featured as marimba soloist on the Indiana State University Symphonic Wind Ensemble's 1997 compact disc, "Symphonic Moments", and has completed several recording projects with the Indiana State University Faculty Wind Ensemble. As director of Indiana State University's Percussion Ensemble and Steel Drum Band, Dr. Finnie has presented numerous concerts on public school and university camouses throughout the State of Indiana. In 1996. the ensembles were featured at the Indiana Music Educator's Association annual conference in Indianapolis, Indiana; and is a consistent presenter at the Indiana Chapter, Percussive Arts Society, Day of Percussion. He and the ensembles recently presented a concert at The 1997 Midwest International Band and Orchestra Clinic in Chicago, Illinois. Along with teaching responsibilities at ISU, Finnie is also principal timpanist for the Terre Haute Symphony and was during the Fall 97 season featured as percussion soloist with the orchestra. He also performs regularly in the area on drum set and steel drum. Jimmy is a summer faculty member at the Blue Lake Fine Arts Camp and is an Artist Clinician for the Zildjian Cymbal Company. He holds the degrees: Bachelor of Music Education from East Texas State University, Master of Music from The University of Georgia, and Doctor of Musical Arts from The University of North Texas. Martha Krasnican, a native of Bethesda, Maryland, received both her Bachelor's and Master's degrees in Piano Performance from the Eastman School of Music of the University of Rochester. While there, she studied with Brooks Smith, Barry Snyder and Frank Glazer. Ms. Krasnican has also worked with John Wustman of the University of Illinois and Menahem Pressler of the Beaux Arts Trio. Currently the head of the accompanying program at Indiana State University, Ms. Krasnican regularly performs with faculty and guest recitalists and for guest master classes. She has also performed as a soloist with the Terre Haute Symphony Orchestra in a concerto written for her by her husband, Daniel Powers. She regularly performs with ISU saxophonist Paul Bro, including recitals at the North American Saxophone Alliance Conferences in Morgantown, West Virginia, Youngstown, Ohio, and Gainesville, Florida. Dr. Bro and Ms. Krasnican also performed on the Composers Concordance Concert: New Music Now! in New York City. In September of 1997, Ms. Krasnican participated in the XI World Saxophone Congress in Valencia, Spain. Ms. Krasnican performs regularly at the annual ISU Contemporary Music Festival, and in November 1998 performed several works at the Society of Composers Region V Conference. "For some time I've been writing music that has been influenced by my involvement with Irish traditional music; I've also written works that came out of my years playing in a gamelan ensemble, and my recent exposure to Albanian folk music. In the past these various musical influences have always remained quite separate--one per work--and I approached each tradition as a translator might, trying to communicate in the language of Western concert music some aspect of the experience of listening to the original. This piece, though, has multiple ethnic and regional influences, and they are all mixed together. I had the image of my own listening experience as a town at a crossroads, where people from all over meet, and their cultures mingle and merge. Albanian instrumental music, renaissance monody, Irish music, the occasional Oriental detail, and hymnody all get combined and juxtaposed, blurred together in this piece. In the first movement, Nightwaking/Distant Past, I was thinking of those moments in which one awakes in a panic, reliving some desperate moment in a dream, only to have the fear and urgency gradually fade back into sleep, or perhaps into the quiet sadness that remains in the separation that time creates between our current selves and our individual and collective pasts. Simple Song/Hymn, the second movement, is just that, a simple song (actually an Albanian dance-trope on a Irish-style lullaby that I wrote for and dedicated to my daughter Elena) followed by an even simpler hymn, which to me is less about any religious symbolism than it is a return to essentials  an outgrowth of my own realization of the joy and deep gratitude to be found in the simple basics of life since the birth of my child. Crossroads Songs was commissioned by Paul Bro, Jimmy Finnie, and Martha Krasnican and the University Arts Endowment Committee, Indiana State University.